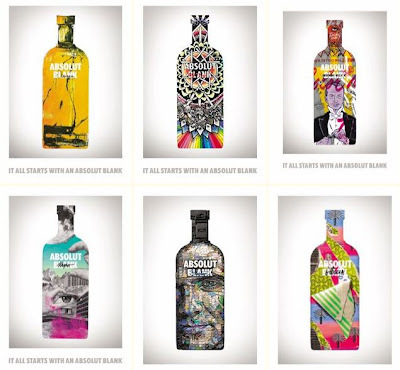 Building on a lifelong history of romancing their iconic vodka bottle, Absolut is inspiring artists around the world with its next adventure. This journey began with a creative brief which was distributed to a number of the world's hottest young artists. Artists were given a clean canvas of a large Absolut vodka bottle and asked to create a masterpiece founded on the basis of their new campaign, "It all starts with an Absolut Blank." The 18 artistically inspired bottles are intended to be a limited run collection. This inaugural line staged its debut in the UK, with plans to air advertising on billboards in L.A. in the near future. The completed artwork will be placed on public display and then extended into print, interactive, digital, collages, murals, and light installations. Take a peak at some of the stunning designs created for this campaign.